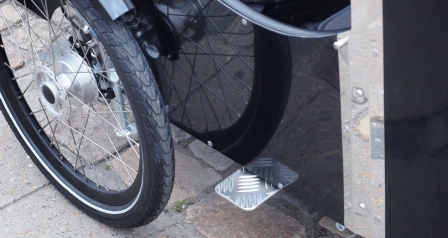 Top quality black aluminium wheel rims, magura parking brake, screws and fittings in stainless steel, built-in fittings for dog belts, hand-built Danish frame with extra horizontal strengthening steel bars in the box, aluminium seat post and cabin floor. Not forgetting the impressive maintenance free steering. The rainhood is included and is only available in BLACK currently. 5 box colors in top quality plastic, black powder coated frame. The nihola bike is the lightest 3-wheeled bike on the Danish market and is built up of quality components. The steering is simple, maintenance free and stable. It is the type used on a car where the front wheels turn independently of the frame. Stability is the key to safety in relation to both the children being transported and the rider of the bike. The cabin that surrounds and protects the children offers an extra level of security on the cigar models. The cabin is built up as a strong double tube frame without corners. The cabin consists of horizontal top and bottom steel tubes. The tubes are welded together with 5 strong vertical steel sections. This construction means that a car bumper will always hit one of the vertical steel sections that protect the children in the event of a crash. The cabin can also be built with an open front frame and an aluminium front door. This construction is however not as strong as the closed frame arrangement. The cabin and the rear end of the frame are built as one unit, this gives extra stiffness and the best possible use of your energy. 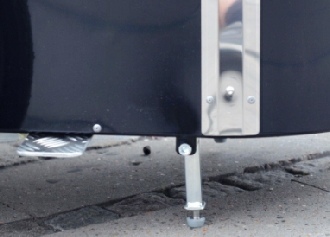 nihola bikes have something unique, a cabin floor that is lower than the centre of the front wheels. This low center of gravity gives extra stability and gives extra space for a carry cot under the child bench, which can easily be removed with out the use of tools. The distance from the seat to the handlebars is also the longest on the market, which our longer legged customers are happy about. All bolts, nuts and washers that are available in stainless steel is used. Our qualified mechanics take pride in their work and that is your guarantee that we don’t compromise on the quality of our bikes. The nihola 4.0 is a practical cycle for families and institutions. The nihola 4.0 cargo bike can carry up to 120kg and there is room for four children up to 7-8 years on the two benches. As an alternative, a carry cot or car seat can be used in the bottom of the cabin and there is still room for two children or an adult can sit on the bench. 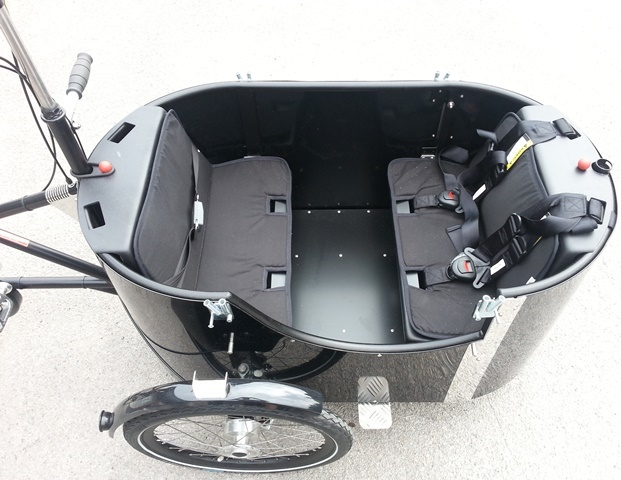 So plenty of legroom and space for shopping too.The nihola 4.0 cargo bike can also carry a stroller. The cabin that encloses and protects the children, provides good security, as the frame is structured as a closed double tube frame without corners consisting of a top and bottom frame that is welded together with vertical steel sections. The nihola 4.0 has the same stable riding mechanism as our other products and is constructed with front support legs when parked. Moreover, it comes with a low side entrance for children.